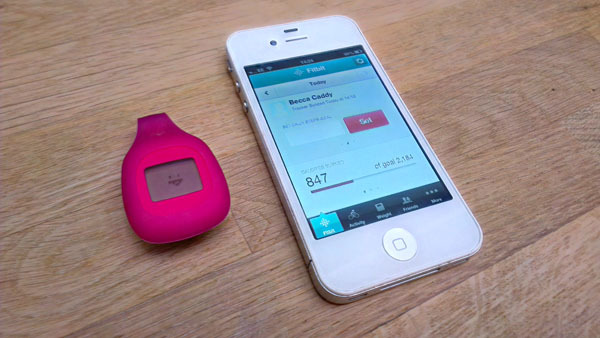 Connected Health » Fitness Gadgets » The Fitbit Zip makes fitness adorable, but is it just a fancy pedometer? The Fitbit Zip makes fitness adorable, but is it just a fancy pedometer? Fitbit’s Fitness Tracker was one of the first gadgets of its kind to give normal people (as apposed to sickeningly fit athletes) a way to track their physical activity throughout the day. Now fast forward to the present day and there are all kinds of monitoring and fitness tracking devices on the market. So in response to the slew of new rivals Fitbit has changed its game a little, redesigning its first product to the tough and slimline One and the budget Zip, a souped-up pedometer. With a face. The Zip is a rather basic option in comparison to the brand’s previous gizmos, with a much more affordable price tag. However, it’s not just like a regular pedometer because it’s been built solely for those who want to not only just count their steps throughout the day, but keep an eye on their calorie intake and take a closer look at their daily data via the comprehensive Fitbit app or web dashboard with sharing and gaming features too. The Zip has a stamp-sized monochrome screen, which you simply tap to display different results, like calories burned, distance travelled, steps taken, the time and a little smiley. In the box with your new Zip you’ll find a tiny receiver that slots into one of your computer’s USB ports, just attach that and the Zip will use Bluetooth to sync up with either an app on your phone (only iOS devices for now, sorry Android users), a web dashboard or both. We like that you can earn little badges for certain achievements, which some may find annoying but we know will encourage many to want to earn more, keep checking back and maybe walk instead of get the bus. Maybe. The step tracking was fairly accurate, although you can go into the web dashboard and add in your stride length if you feel like it and want an even more accurate reading. Obviously the Zip can’t watch and monitor what you eat, so you’ll have to manually add in your meals and snacks too and then the device will measure calories burned accordingly. So come on then, adorable but pointless? Or useful? The Zip is really accurate when it comes to tracking your steps throughout the day, automatically syncs without fail and we can’t get enough of the fact that you can tap the screen to see different types of data. The only drawback of the Zip is the design of the silicone holster, we’re not sure how it could be more secure, but attaching it sometimes just doesn’t feel safe enough and there were nearly a few accidents when the poor, smiling, little Zip could have been left all alone on the pavement. FOREVER. We also wonder whether we’ll keep up with it, attaching it everyday and removing it from clothes so it doesn’t get put in the watch seems tedious and makes us wonder whether devices that you actually wear, like Nike’s FuelBand will suit some people much more. You can buy the Zip in a range of different colours from the online Fitbit store for £49.99. This story was first published on Connected Health’s sister site, ShinyShiny.tv.